Kate Birch and Cilla Whatcott, Co-Founders: Kate and Cilla began collaborating in 2010 to bring about change in the vaccine paradigm. In 2008 Kate was introduced to Dr. Isaac Golden’s work on homeoprophylaxis. Since 2009 she has made homeoprophylaxis available for children in North America. 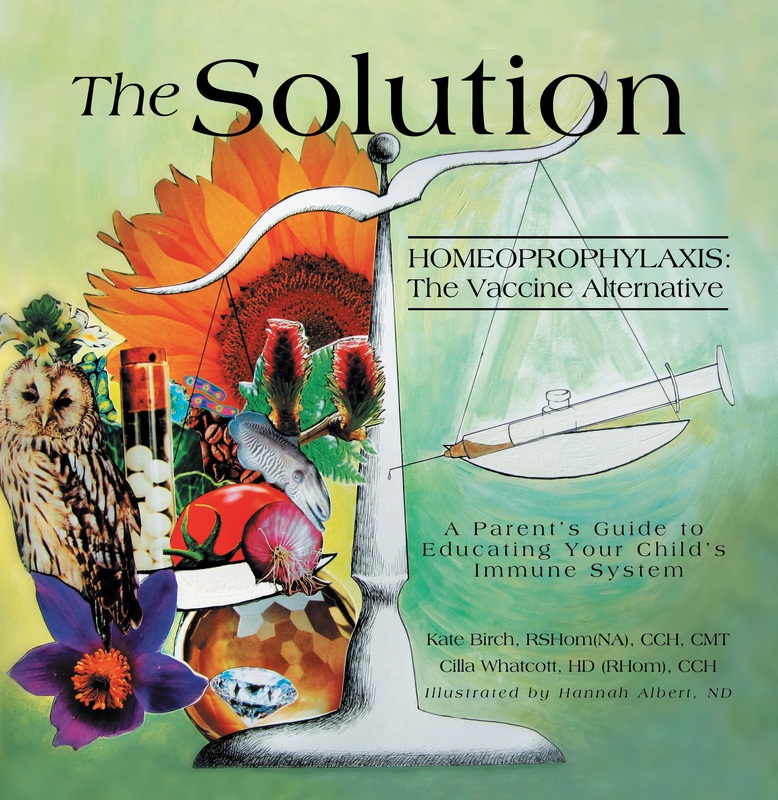 To expand awareness of homeoprophylaxis they co-authored The Solution~Homeoprophylaixs: The Vaccine Alternative, a comprehensive guide for parents wishing to educate their children’s immune systems. They are co-founders of Free and Healthy Children International a non-profit dedicated to Education, Research and Access to Homeoprophylaxis. Cilla resigned from the board in 2014. Treasurer: Alison Bell. I am an experienced leader in marketing products and services. I excel at developing relationships and mentoring others – particularly small business owners. My resume includes key leadership roles in expanding businesses as well as recruiting and hiring high-quality sales professionals. I have maintained force staffing levels in extremely volatile industries. Coaching supervisors to help salespeople attain top levels of performance and training new-hires in effective techniques for selling our products and services are among my specialties. Editing/Documents Coordinator: Mary Baenen HMP, C.HP. International Development Coordinator: Kate Birch RSHom(NA), CCH, CMT. A Minnesota based homeopath, Kate has been registered with the North American Society of Homeopaths since 1996 and is Certified in Classical Homeopathy (CCH) by the Council for Homeopathic Certification. She is a past vice-president of the North American Society of Homeopaths and remains the North American liaison to the International Council of Homeopathy. She has a busy family practice and lectures locally and internationally on homeopathy for infectious disease, children’s health, and vaccine damage. Amber has been principal homeopath at Rocky Mountain Homeopathy since 2008. She is a classically trained homeopath who believes the world needs a bigger vision of health. She came to homeopathy after seeing its power helping members of her own family attain good health when conventional medicine offered little hope. Amber’s favorite aspects of homeopathy are its individualized approach for every person and its unparalleled record of safety. Amber is a graduate of the Colorado School of Homeopathy (now Homeopathy School International) and The Catalyst School of Homeopathy. Office Administration: Sarah Damlo Classical Homeopath & Herbalist. Sarah is a graduate of the ACHENA accredited Northwestern Academy of Homeopathy, where she has studied classical homeopathy since 2013. She has also studied with known herbalists Matthew Wood and Jessie Belden, among others. She is passionate about wholism, homeopathy, and herbs, and wildcrafts many remedies from her native Minnesotan surroundings. Sarah currently practices at HippHealth and The Medicine Tree, both in Minneapolis. Internal Communications Representative: Umangini Desai CCH, RSHom(NA), BMHS. Uma belongs to a family of medical practitioners, which has been engaged in the field of medicine for over fifty years. The atmosphere in her family has always been conducive to education and Dr. Uma knew, from an early age, that she wanted to be part of the medical profession; because it helps mankind to be healthier and happier. Understanding “simila similibus curentour”—”like cures like”, the principle of homeopathy—Uma decided to make this her career path. She graduated from Sardar Patel University in India with a B.H.M.S (Bachelor of Homeopathy, Medicine, and Surgery) degree. After completing her BHMS, she practiced homeopathy and joined ICR (Institute of Clinical Research in Homeopathy) for two years. She is a certified member in Classical Homeopathy by the North American Society of Homeopaths. Uma has presented many cases in seminars and workshops with her colleagues and she volunteers services to the poor and schools in underdeveloped areas. Uma studied with Kim Kalina (follower of Dr.Tinus Smits) has been successfully utilizing CEASE therapy to help children and adults with a variety of healthcare concerns. She has been on the board of Free and Healthy Children International since 2015. Public Communications Representative: Ursula Dobelman n CCH. Ursula started in the holistic healthcare field as a Board Certified Massage Therapist in 1983. In 2001 she became Certified in Classical Homeopathy (CCH) and in 2010 added certification as a CEASE Therapy practitioner to help families with children with autism. In 2015 she became certified in Homeoprophylaxis, the vaccine alternative and is now happy to offer this option, a safe, effective and non-toxic system. She has been with the board at FHCi since 2015. Ethics/Legal Representative: Adelle Hansen Esq. Adelle obtained her law degree in 2007 from Mitchell Hamline School of Law, St Paul, MN, and was admitted to practice in 2008 under the Minnesota State Bar Association. Her legal background includes counseling businesses on best practices for tax preparation, advising individuals/businesses on contractual agreements, consulting with landlords on best practices in tenant/landlord law, advising a business on employee matters and drafting/reviewing commercial leases. She has experience in probate and estate law. Most recently, Adelle consulted with the Vaccine Safety Council, a MN non-profit organization. After becoming a mother to a 29-week-old preemie, she began researching holistic alternatives and studying the safety of vaccines. She came upon an advertisement in a dental office for a lecture on alternatives to vaccines (HP), after which she started the homeoprophylaxis program with her daughter under the research umbrella of FHCi. Outreach Coordinator: Tana Harahan C.Hom, EMT-B. Tana currently works in Minneapolis in a clinic focusing on vaccine injured children, pediatrics, and families. She came to homeopathy after her son was born prematurely and she truly believes that homeopathy saved his life. Tana studied at Northwestern Academy of Homeopathy for four years and a fifth year graduate program. She has a degree in early childhood education with an emphasis on pre-med. She is an EMT and is currently studying para medicine and is training as an RN. Tana also worked as a behavioral support specialist for adolescents. She is passionate about FHCi and promoting the health of our children. International Liason – India: Kavitha Kukunoor CCH, RSHom(NA), BHMS, C.HP Kavitha Kukunoor is a homeopathic practitioner from India. She graduated with a Bachelor degree of Homeopathic Medicine and Surgery (BHMS) from University of Health Sciences, Andhra Pradesh, India, and has been in practice since 1996. She conducts HWC health inn shows for educational and public awareness and practices classical homeopathy; also uses Bach flower, tissue salts, and color and sound remedies. Certified in organotherapy, detox, and drainage remedies. She mentors students and conducts lectures on homeopathy internationally. She is a certified classical homeopath, registered member of NASH, and Governing body of Homeopathic World Community (HWC) branding & Administrator. Technology: Marci Mearns CCH, RSHom(NA). Secretary: Shiba Surti CCH, BHMS. Shiba graduated in 1998 from Ahmedabad Homeopathic Medical College, India and has over 15 yrs of experience in Women’s and Children’s Health. She is also a certified CEASE therapist. Shiba helps families with coaching and counseling during their transformation to improved health and has been a board member of Free and Healthy Children International and California Homeopathic Medical Society since 2015. Is a graduate of Northwestern Academy of Homeopathy and a Homeopathic Master Clinician from Luminos Homeopathic Courses. She is a Registered Pharmacist and has a private homeopathic practice in St. Louis Park, MN, out of the combined offices of The Minnesota Center for Homeopathy. She serves on the Board of FHCi to bring her expertise of detail oriented work to the data collection and analysis of the organization’s ongoing research in homeoprophylaxis. We are working on compiling a list that our CA HP supervisors will have. For now contact one of our supervisors directly to learn about their network. I am in Northern California and can do this for you.